Wouldn't it be cool to plug your guitar, or your instrument, into your wireless system? This cable lets you! AND gives you great sound. 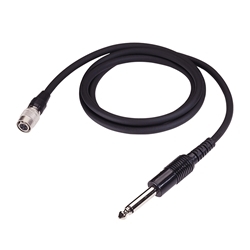 Wireless hi-Z instrument/guitar 3' cable with 1/4" phone plug, terminated for use with the UniPak transmitter.